For well over a decade now the United States of America has defined its foreign policy around President George W Bush’s axis of evil theory, forever justifying its infringements on international law, freedom and democracy by playing its national security card.Since 2001, world’s relations have been solely defined by “Islamic terrorism”, to the point where geo-strategic alliances were thrown out of their axis, with countries forced to contemplate putting their immediate interests at risks not be branded sympathizers to “Islamic terrorism”. The moment New York Twin Towers fell, America was at war with an invisible and elusive enemy, so-called “radical Islam”! One has only to look at the Islamic world- spanning from the African continent to the Middle East and Asia – to understand that America’s war on terror has not only transformed foreign relations, it has plunged the world into a never-ending cycle of violence and bloodshed, tearing apart communities. But could it be that the world has been sold on the biggest lie yet? Could it be that the very country which has assumed the role of global crusader against terror has been covertly promoting radicalism; using fear as a weapon to subdue and conquer nations? The founding father of democracy, the advocate of civil liberties and freedom, the United States of America is in fact a neo-imperialistic state which has worked to enslave other nations through fear, political manipulation and economic blackmail. Standing behind the wheels of the world’s most powerful organizations – the United Nations Security Council, the International Monetary Funds, NATO, World Bank, World Food Program – the US can with the flick of its hands isolate, bankrupt or invade any given nation, at any given time, should its leadership oppose its supremacy. All those who dared challenge Washington’s authorities paid the ultimate political price, which on occasions meant actual assassination. In 2002 Late Venezuela President Hugo Chavez was ousted by a CIA-backed coup d’état for he refused, among other things to distance himself from Iran and the Hizbullah. Late President Chavez infuriated Washington when he publicly denounced US President George W Bush bombing campaign in Afghanistan. «This is fighting terror with more terror» he declared on national television in October 2001. In 2003, the US invaded Iraq by claiming now-deceased Iraqi President Saddam Hussein was developing weapons of mass destruction. When no weapons were found the US flipped its narrative by alleging the Iraqi regime had been working with al-Qaeda. Tricked by the media machine into believing that Saddam Hussein was the spawn of evil, many forget that his only sin – in the eyes of Washington – had been to challenge the US economically by attempting to make a break from the petro-dollar. Rather than sell its petrol in dollars, late President Hussein wanted to switch to the Euros, a move which would have directly threatened Washington’s monopoly on the Oil and Gas trade industry. While the Pentagon was able for a decade to cover its terror tracks, playing the media and the public to its propaganda tune, Syria has been its undoing. A key power in the Levant and the Middle East, Syria’s protracted war has forced world’s powers to lay bare their agendas, opening for the first time a window onto Washington’s inner strategy and network of alliances. After a decade of playing the terror card, Washington came to openly declare its support of radical Islamists, alleging Takfiris militias are a necessary evil against the regime of Syrian President Bashar al-Assad. As of January 2014, the US Congress has decided it will provide military and financial support to militants in Syria, having classified Takfiris fighters as moderates. According to US military sources weapons are delivered to militants in Syria via Jordan, where it is important to note Saudi Arabia and Qatar have set up training camp for al-Qaeda wannabe Jihadists. 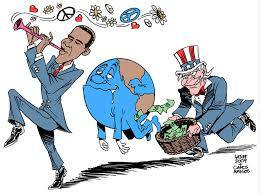 However way one choses to look at the world, America has become the biggest exporter and promoter of terrorism. * Catherine is a commentator and political risk consultant. Her writings have appeared in Foreign Policy Association, the Guardian and Majalla among many others.